Cometh all this newe science that men lere. This celebrates the extraordinary life of John Sinkankas, who passed away on May 17th, 2002 at his San Diego home, after a brief illness. All of us in the industry are better professionals because of John’s words and work. His love of the earth has produced volumes of insight, scientific knowledge and wisdom. So we take time to honor this remarkable individual. 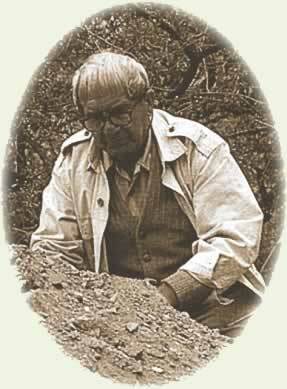 Born on May 15, 1915 in Patterson, New Jersey, John Sinkankas began his life-long love affair with minerals at age seven in the famous traprock quarries near his home. After a 25-year career as a flyer with the US Navy, during which he rose to the rank of Captain, he devoted himself to his passion – rocks, minerals and gems. His first book on the subject was published in 1955 and since that time he has published 14 others. In addition to his writing and flying, John was also a talented artist, with his watercolors featured in a number of his books. Two fine examples of his watercolors are featured in these pages. Pilot, author, bibliophile, bookbinder, collector, artist, lapidary, historian, scholar – John Sinkankas was the epitome of the Renaissance man. 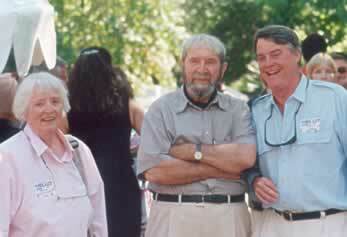 Marge and John Sinkankas, together with William Larson at John’s 85th birthday celebration. Photo courtesy of Robert Weldon. On February 5, 1940, then Ensign John Sinkankas married his college sweetheart, Marjorie Jane McMichael in Key West, Florida. 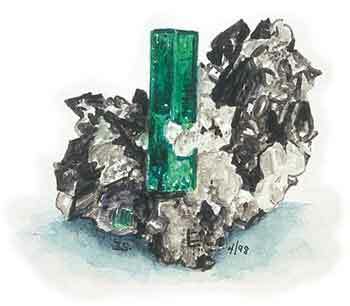 Thus began one of the most successful partnerships in the field of gems and minerals. John and his wife, Marjorie, have long shared a love of books. Together, they operated Peri Lithon Books, one of the country’s finest dealers in antiquarian books on the earth sciences. In 1988, their personal collection of over 13,000 items – more than 40 years in the making – was acquired by the Gemological Institute of America and today forms the foundation of the Richard T. Liddicoat Library. John is survived by his wife, Marjorie, and their four children: John William, Seattle, WA, George Martin, Knoxville, TN, Sharon Jane Tooley, San Diego, and Marjorie Ellen Coates, Atlanta, GA. They have also been graced by six grandchildren. 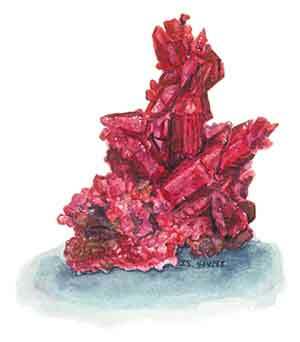 Among the greatest authors in the field, John Sinkankas’ name was virtually synonymous with the world of gems and minerals. John penned over 100 articles and fifteen books on the subject. We are pleased to present the following pearls from the Sinkankas canon. Virtually all of these have gone through various printings and editions and each is a classic. 1959–1997 Gemstones of North America. 3 Vols. 1993 Gemology: An Annotated Bibliography. 2 Vols.